Facebook‘s stock dipped early Monday morning. The social media giant has faced intense criticism over news that Cambridge Analytica, a political research company with ties to President Donald Trump, had allegedly illegitimately obtained and used 50 million Facebook user profiles. US and UK lawmakers fear the data was used to sway voters in the last presidential election and Brexit. 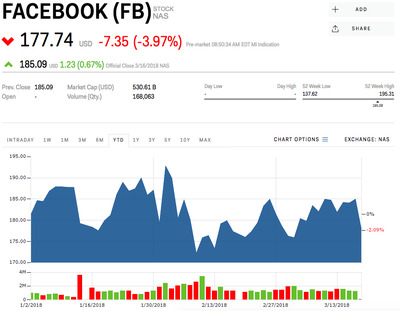 Shares of Facebook fell 4% early Monday morning after news broke over the weekend that a third party was accused of accessing and using the data of more 50 million Facebook user profiles without their permission. The New York Times and Guardian reported Saturday that the controversial political research outfit, Cambridge Analytica, was accessed user information for highly targeted political ads on Facebook. UK lawmakers have already questioned Cambridge Analytica executives in court over it’s handling of Facebook’s private user data and its involvement in manipulating voter beliefs in the Brexit elections. Damian Collins, a member of parliament, said he plans to ask Facebook CEO Mark Zuckerberg or a senior executive to testify before the group. The attorney general of Massachusetts, Maura Healey, said she may launch an investigation into this matter. European regulators have been especially concerned over privacy and what happens to Facebook’s trove of user data. Facebook’s stock was trading at $US177.74 per share, and was down 2.09% for the year.